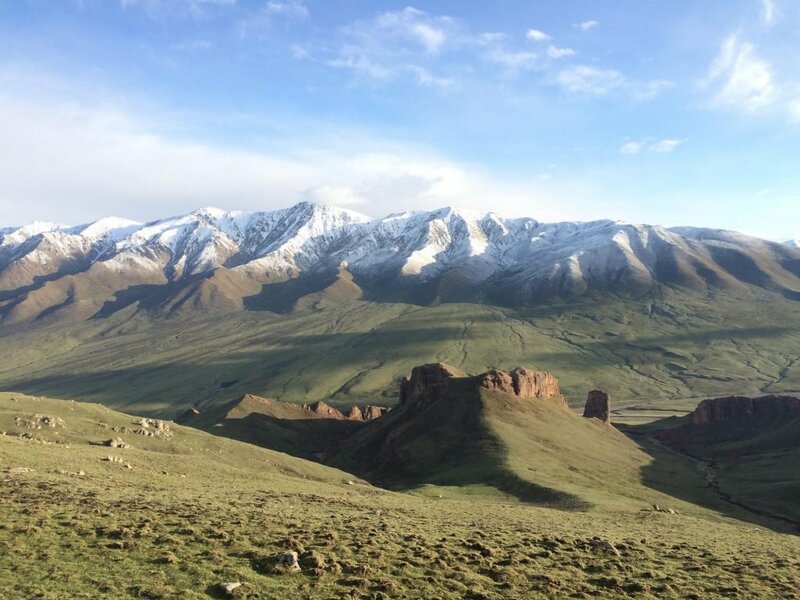 Qutan Monastery – another incredible day trip! Qutan Monastery used to house between 400-500 monks. But if you visit it today the monastic staff has been reduced to a skeleton crew of exactly 11 monks who are now in charge of lighting butter lamps and caring for the grounds of this large, holy complex. 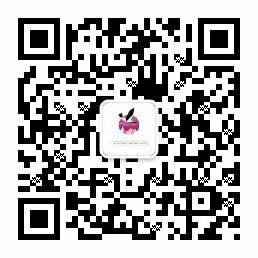 Driving from Xining, you can take the G6 highway east towards Ping’An and Lanzhou. After 44km on the G6 you take the exit for Ledu 乐都 and then get off the freeway ramp into the small, relatively obscure town of Ledu. 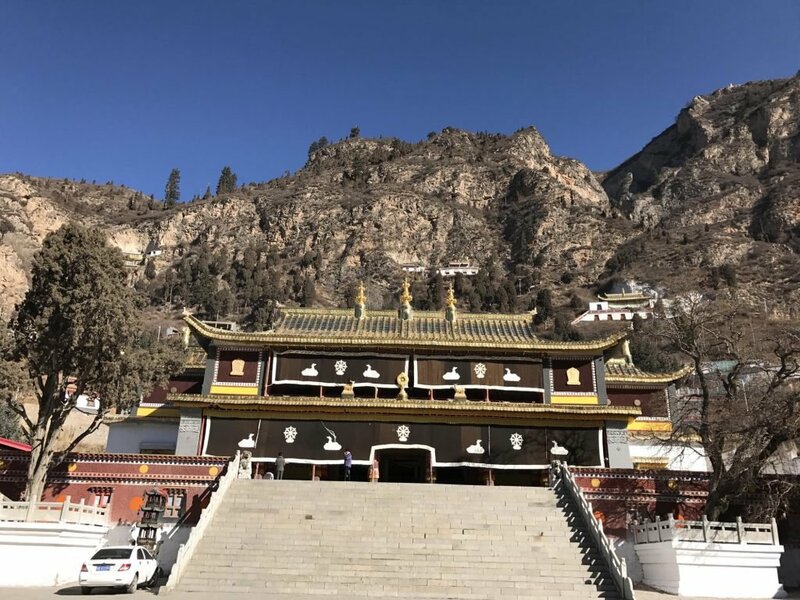 Ledu in the original Tibetan language means “entrance to the valley” and anyone driving from Lanzhou to Xining must pass this tiny town in order to enter the valley that bisects the large mountains to the north and south of the highway. Take this road and it is about another 20 minute drive to the actual monastery. This road to the monastery is currently a narrowly badly paved road with a good deal of bumps, potholes, and poorly maintained road repair that winds through a few dusty Tibetan villages to about 8,000 feet in altitude where it drives in front of the monastery. However, as I was driving the road on January 5, 2018 I noticed a good deal of construction and it appears that within the next year the government is planning on building a 4 lane elevated highway to this formerly unknown and remote spot to promote tourism among local Chinese. After crossing a bridge to the monastery you can park directly in front of the outer courtyard. 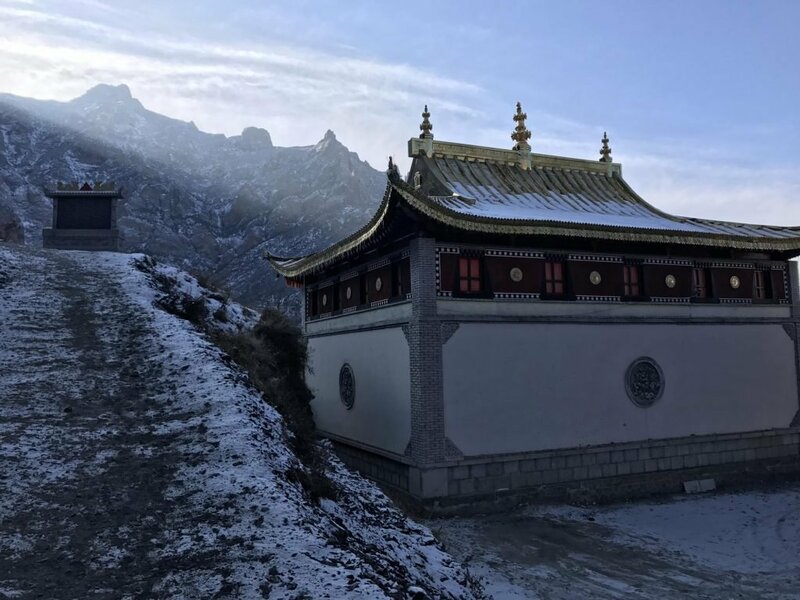 Unless you are Tibetan or Mongolian, you will need to pay the 50 RMB/person entrance ticket fee for the monastery in the small white tin shack on your right as you enter the monastery. Once you pay your ticket, you can enter the first courtyard with two large and beautiful temples set among a peaceful environment. 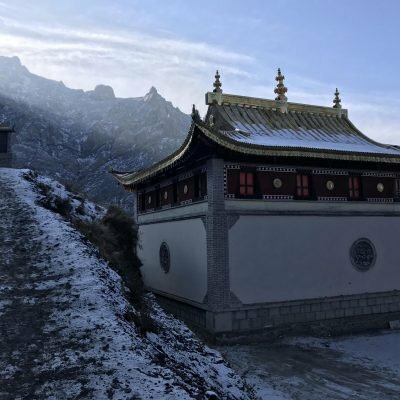 During the winter I was practically the only person in the whole monastery complex and we had to ask a monk to unlock a few of the temples which had been bolted shut. 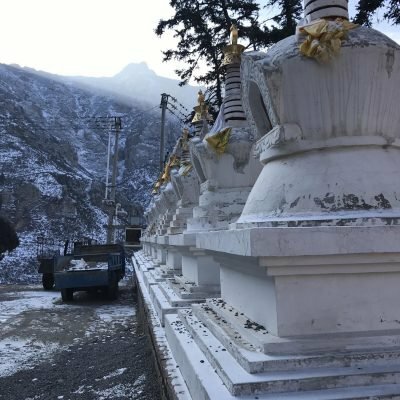 Being one of the few people wondering the temples and the old style stupas made this a very thoughtful and quiet winter experience. The back corners of the monastery were very dark and cold and it felt like no one had set foot there in a few hundred years. And it was certainly one of the cleanest monasteries I have ever been to. Every courtyard and temple was immaculately swept and I did not see a single piece of trash or debris anywhere. I guess the advantage of having such a small staff is that there are not as many people to clean up afterwards. It would be easy to spend about 2-3 hours meandering around the various halls, temples, courtyards, and stupas of the monastery. Of particular interest are the hand painted Thangkas painted on the back wall of the main temple. These 7th century artifacts are easily 10 meters high and 10 meters wide and I have actually never seen another Thangka wall painting (not painted on a canvas but directly onto the wood frame of the wall) that was either this big or this original. If nothing else, it would be worthwhile to walk through the temples just to see these incredible pieces of preserved history. Other things of interest in the temples include a giant drum with a 1 meter-diameter leather cow skin stretched over an impressive metal frame. I tapped every so lightly on this skin and it belted out a very deep tone, like the tone of an ancient leviathin rising out of the water from beneath. My mind instantly raced to a time when monks pounded on this monstrous drum and the base vibrations must have shaken and stirred the entire surrounding village with reverence and awe. 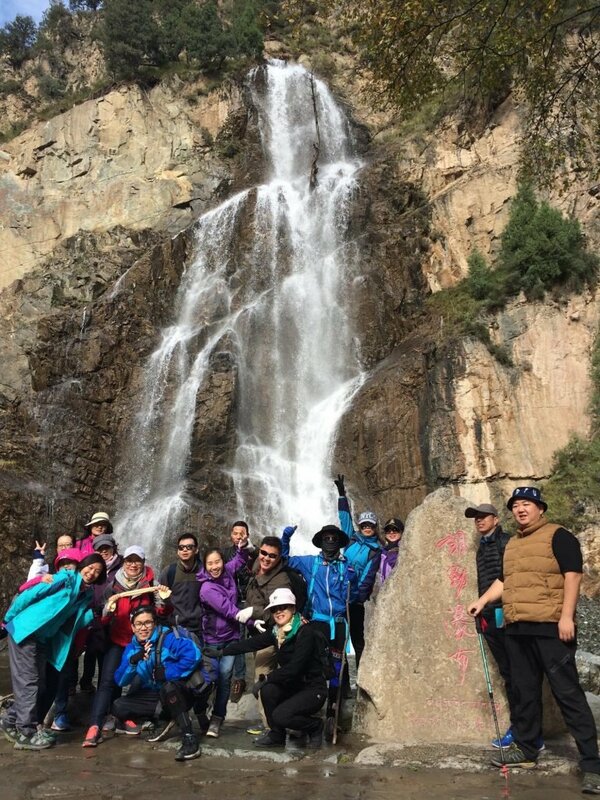 If you have a day or a half a day in Xining, I can highly recommend this trip to Qutan Monastery. 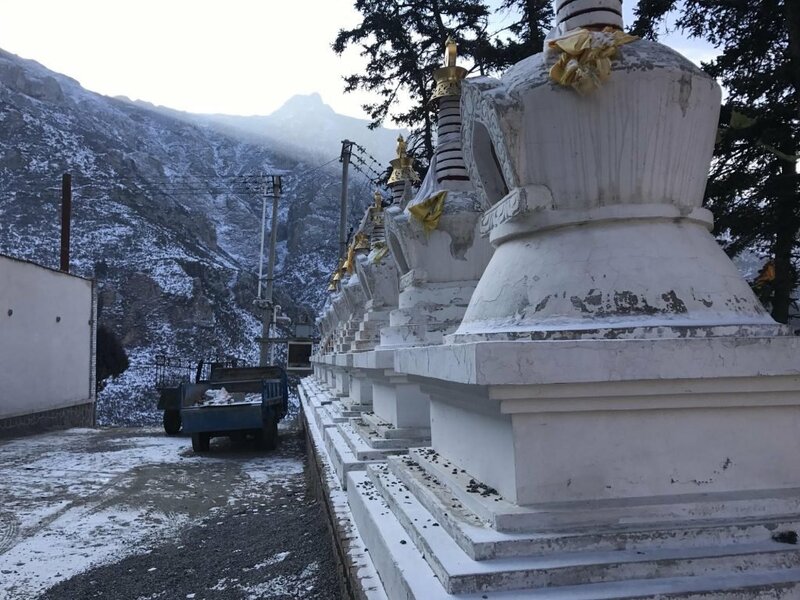 If you have another 1 hour or so to kill you can drive another 8km up the road (sometimes a little icy in the winter) to Qutan’s smaller sister monastery that has the same small amount of monks taking care of the monastery. 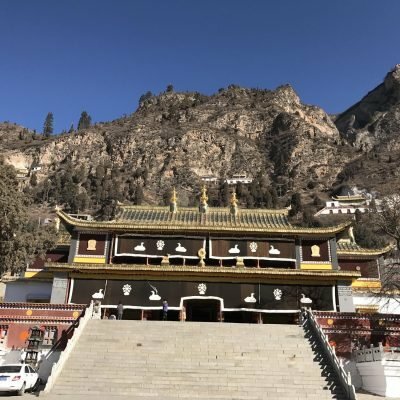 This sister monastery only has 2 temple halls and does not offer much in a divergence from the original Qutan Monastery, so don’t get your hopes up too much here. But the monastery does provide a great view into the high mountains of this valley. 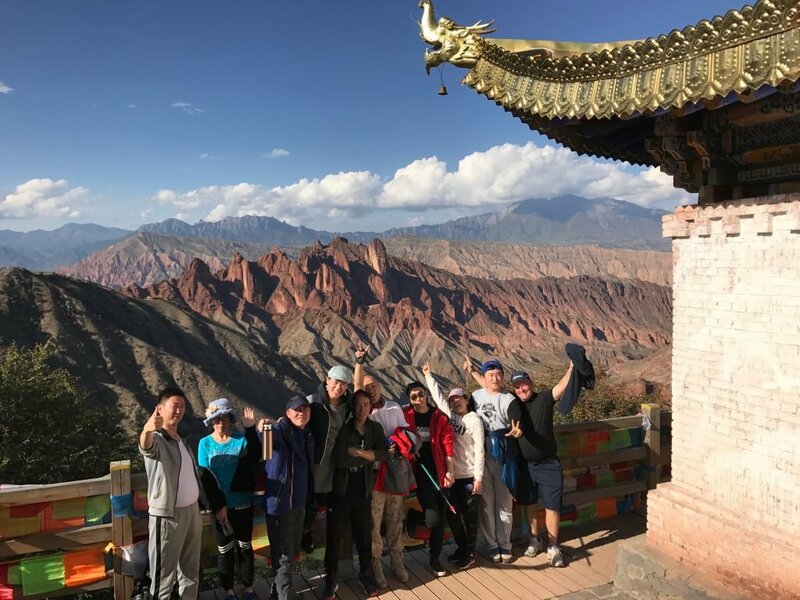 This smaller sister monastery also overlooks the Qutan Ski Resort, which is nothing more than a small bunny-hill type plain with a 5% slope grade where novice Chinese learn to ski. While this “resort” would be an insult to any serious skiiers, the slightly inclined slope looks like a fun place to bring the family in the winter for tubing or just sliding around the snow. 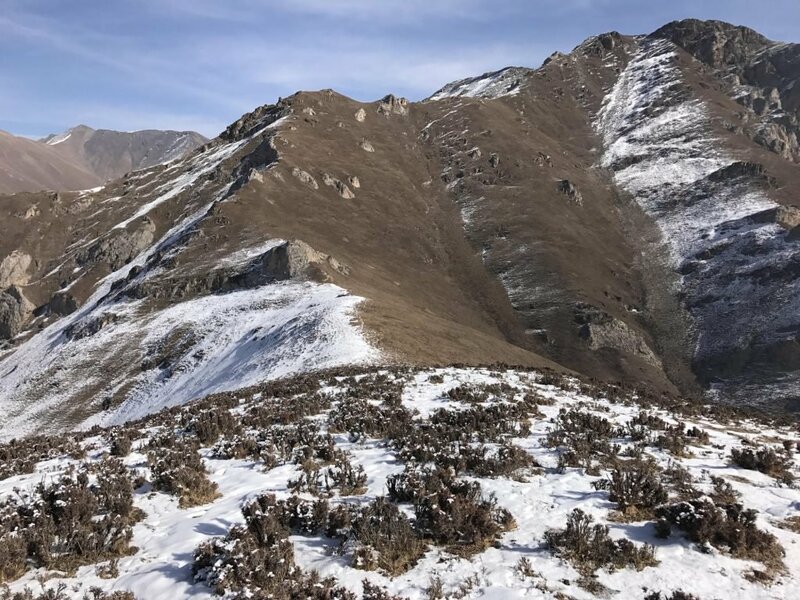 With an entrance ticket price of 70 RMB per person this pseudo-ski resort doesn’t offer much in the way of real skiing but could be a nice day trip for families looking to fight off the long wintry “cabin fever” from the chilly winters in Xining at 2,300 meters above sea level. 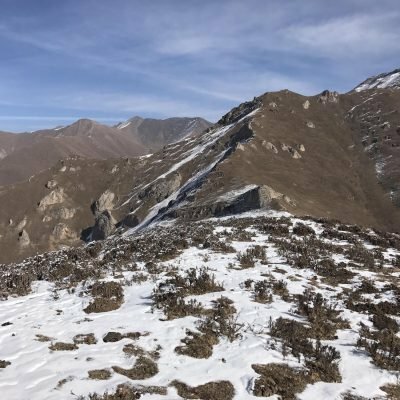 In either case, some may find the gaudy, cheaply built ski resort here as an utter contradiction to the peace and stillness found in both the upper and lower Qutan Monastery complex. I am sure, at the very least, it makes the monks in their red-robed reverence very curious and even cautious about how quickly the world around them is changing.